Microphlebectomy is a minimally-invasive procedure to remove segments of large varicose veins near the skin. The older procedure which used to be performed through ½ inches or larger incisions is called “phlebectomy”. The newer “microphlebectomy” procedure involves 2-3 mm (less than 1/8 inch) incisions. Microphlebectomy is a very important procedure in modern management of varicose veins since it involves removal of large abnormal veins with faster recovery of the tissues than with other techniques. Although microphlebectomy can be used to treat isolated small varicose veins, microphlebectomy usually is performed to treat large, ropy varicose veins over 5 mm in diameter. Foam sclerotherapy is an option for treating large varicose veins, but sclerotherapy may leave a cord under the skin or dark pigmentation of the skin for months after treatment of large veins. Patients who are treated with microphlebectomy for large varicose veins often have better cosmetic results sooner than with foam sclerotherapy. Most patients have tiny white scars at the microphlebectomy sites within 6 months after the procedure. Most patients take a small oral dose of an anti-anxiety drug and a narcotic pain tablet about one hour prior to the procedure, though some elect to take only a non-narcotic drug such as naproxen or ibuprofen. The location of the veins is marked on the overlying skin with the patient standing. The procedure is performed in one of our two operating rooms which are designed for vein procedures. After skin preparation with an antiseptic and sterile draping of the leg, local anesthetic is placed in the tissues around the veins using a small needle. Tiny incisions approximately 2-3 mm in length are made in the skin adjacent to the veins with the tip of a scalpel blade. A tiny stainless steel hook is placed through the incision and the vein is pulled through the incision with the hook. Huge veins which measure 20 mm or more in diameter when filled with blood can be pulled through 3 mm incisions by means of this technique. Total blood loss usually is less than a tablespoonful! A surgical dressing is applied over the incisions followed by a compression wrap. Two days after the procedure, the patient removes the dressing, showers, and applies light pads over the incisions and resumes use of elastic support hose. Frequent walking is encouraged by the day after the procedure and runners are allowed to get back to running as tolerated after 7 days. Most patients use naproxen or ibuprofen after the procedure for discomfort and most use very little narcotic, if any,after the procedure. The final stage of microphlebectomy.Large, ropy varicose veins near the skin once were removed with 10-20 mm(up to ¾ inch) long incisions, considerable tissue trauma and bleeding, and substantial discomfort due to bleeding in the tissues and skin stitches. Modern techniques are very different and involve 2-3 mm (less than 1/8 inch) long incisions. 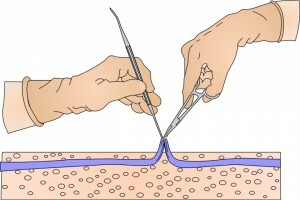 The modern technique performed with the small incisions often is called Ambulatory Microphlebectomy to recognize the difference in the size of incisions. The office procedure is performed with a special kind of local anesthesia which numbs the tissues and usually results in less than a tablespoonful of blood loss for removal of many large varicose veins. The procedure often lasts 30 to 60 minutes and the patient usually is at the office less than 2 hours. Most patients may return to work activities within 1 to 4 days. Microphlebectomy requires no sutures and the long-term appearance frequently is one of tiny white lines in the skin at the sites of the skin incisions. This technique works well for veins measuring at least 4-5 mm in diameter near the surface of the skin. An alternative treatment for many of these veins is ultrasound guided foam sclerotherapy.